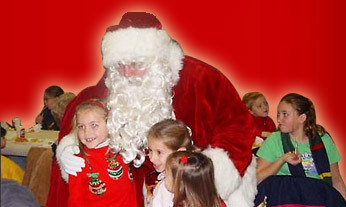 The Children's Lunch with Santa is held at the St. Joseph Catholic Church Hall on VanAiken Street on Saturday December 7, 2019 . The lunch is one of the original events of the festival. Serving time 11:00 AM and 1:00 PM. Serving over 300 children a free lunch of hot dogs, chips, desert and beverages, every child receives a gift package of items donated by area businesses. During both lunches, cartoon characters visit with the children and the grand entrance of Santa and Mrs. Claus with their band of elves bring smiles to all that attend. Even though the lunch is free, tickets are required. Tickets are available at the Ida Branch Library at the Ida Township Hall. The Lynn C. Weeman Post, American Legion and Auxiliary have received national recognition by the National organization of the American Legion for this contribution to the community.